From commissioning to design to construction to platform or scaffolding installation, any form of access equipment needs to be backed by a diverse mix of expertise and a thorough knowledge of Australian and global safety standards. And you need to know that your equipment is made in facilities that uphold high standards of accuracy and build quality. At SafeSmart Access, all of these factors are crucial to the final product and client satisfaction. Whether it is for an ongoing standard range supply or to build custom solutions, SafeSmart Access manufacture most equipment in Maungaturoto, New Zealand. 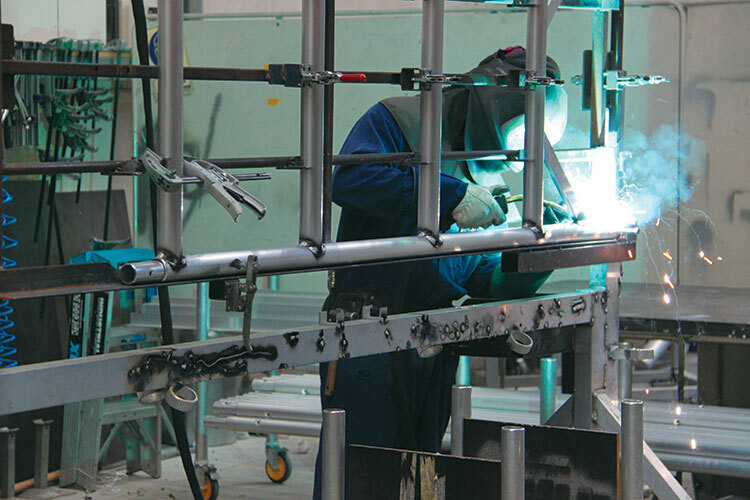 At our ISO:9001-certified manufacturing facility, SafeSmart makes access and worksite safety infrastructure such as ladders, platforms, edge protection systems and scaffolding that are sturdy, highly manoeuvrable and compliant. Two manufacturing lines are always running at Maungaturoto, to keep servicing our branches around the world with a constant supply of diverse products, and to make sure that custom solutions are being delivered in a timely manner. With ongoing production, SafeSmart's products are always on the move from the factory to strategically located branches across Australia, New Zealand and the rest of the world, so that local representatives can provide consultation that is locally-informed and understanding of your requirements. From individual components to the completed structure, SafeSmart's quality assurance (QA) team are highly trained to assess your products for robustness and a professional finish. The QA team also makes sure that the product meets the brief one hundred percent, with consideration for your original requirements for measurements and type of structure or machinery you need to access. Once your access solution is made, SafeSmart Access also offer onsite consulting to make sure that your access stairs, platform or scaffolding installation is carried-out according to stringent safety standards and that you get the best value access to structures for ultimate work speed efficiency. If you have any enquiries about how SafeSmart's design and manufacturing process can benefit your desired access solution, get in touch today.